Arbelos, Semicircles, Diameters, Circle, Incircle, Incenter, Square, Midpoint, Concurrency. 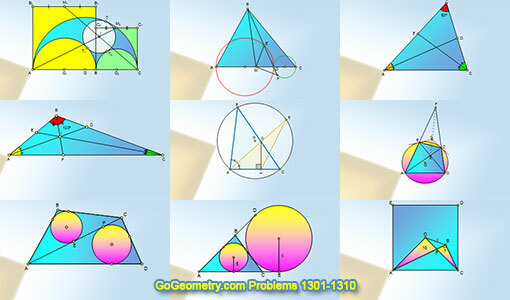 Typography of Geometry Problem 1301. Triangle, Median, Midpoint, Circles, Diameters, Congruence. Triangle, 60 Degrees, Angle Bisector, Measurement. Triangle, 120 Degrees, Angle Bisector, Measurement. Typography of Geometry Problem 1304. Triangle, Circumcircle, Angle Bisector, Arc, Perpendicular, Area. Cyclic, Inscribed Quadrilateral, Circle, Tangent, Diagonals, Collinear Points. Triangle, Incenter, Parallel line, Sides, Measurement. Quadrilateral, Diagonal, Triangle, Incircle, Tangent Line, Sides, Measurement. Triangle, Circle, Inradius, Excircle, Tangent, Exradius, Measurement. Square, Center, Right Triangle, Area, Measurement.